Having explained the tenets of my sand tray therapy I will now move onto ways in which it can be utilized through three session plans dealing with the three different symptoms previously mentioned. I will start with a lesson plan the sexually abused client whose presenting symptom is anxiety. I would start with the Hello Kitty tenet and ask the client to build their safe place or a world in which they would feel safe. We would then explore that world to discover what exactly makes the client less anxious. An alternative to this would be to build a fun world. This would build rapport and allow the therapist and client to see some potentially anxiety reducing activities for the client to utilize. We then move onto the bonsai tenet. Keep in mind the first tenet could take a couple of sessions. The bonsai comes in only once rapport is built. In the bonsai phase we start to identify anxiety provoking triggers and corresponding coping skills to employ. Like the caring for a bonsai tree can provoke a sense of calm, so do the coping skills learned in this stage. The client could choose calming miniatures to put in the sand tray. The client and therapist could then explore what each of these mean and tease out coping skills to use when anxiety is triggered in the client. This could be done as a new sand tray or built onto the Hello Kitty sand tray. Lastly, but maybe most importantly we start to explore the abuse. It is important to have completed the bonsai stage beforehand so that the client has the skills to cope with the emotions triggered during this process. The whale reminds us not to shy away from the uncomfortable or upsetting subjects and ‘go there’ with our clients. It also reminds us that sometimes it is ok to confront and challenge our clients. In this phase the therapist could ask the client to show her the abuse in the sand tray. Or do a sand tray on the offender. To ease the client into it, the client could do a sand tray on that time in their life. As this will undoubtedly be upsetting to the client, it is important for the therapist to remind the client of the coping skills learned in the previous stages. They can add these to the sand tray. It is the goal of this stage for the client to be able to make the story of this sand tray have a positive ending. Again do not expect this to be accomplished in one session. 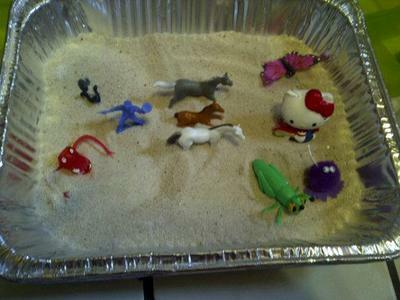 The next sand tray therapy lesson plan is for the client who has behavioral/anger problems. A lot of the clients I see who have been sexually abused act out in an aggressive defiant manner. My first step is to talk to the parents or guardian about consistent non-corporal punishment as previously mentioned. This is a very important step because consistency at home with children is so very important to behavior change. Once again we start with Hello Kitty and build a fun sand tray. For this client I would let them pick any type of sand tray they want. I would suggest some various fun themes but be sure to mention that they can build what they want. I have found that with children who are acting out, giving them some lee-way in the beginning works best so that the first couple of sessions don’t result in a power struggle, or as much of one. In the next tenet we explore some of the triggers that anger the client and result in the disruptive behavior. This phase may have began in the previous stage, but either way in this stage these triggers and resulting behavior are explored as well as coping skills to reduce the anger and therefore resulting behavior. In this stage I would ask the client to build a sand tray of their anger or an angry sand tray. I would also suggest even building an angry volcano. A lot can be learned from these sand trays. Then we would move onto the bonsai tray. In this stage the client would build the antitheses to the angry sand tray. The client would build a calm sand tray. The client could add onto the angry sand tray or build an entirely new sand tray. Through these sand trays the client and therapist explore coping skills that can be utilized to calm the client when they begin to feel angry and therefore curbing the disruptive behavior. If the client built an angry volcano, they could then repair the damage caused by the volcano. This could teach the client that there are consequences to our actions and that ultimately we can alter and control our emotions. Finally, we would move onto the whale stage and explore the abuse. Again we could build a sand tray about the abuse or the offender. It is entirely likely that the client has already mentioned the offender if not the abuse by now. Remember the previous stages will take more than one sand tray! 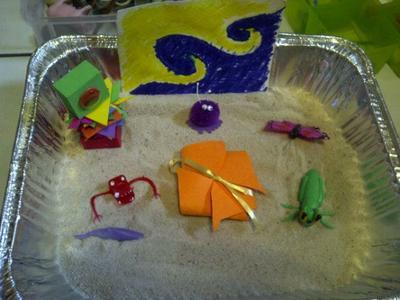 After the client has built the abuse sand trays, they can write a letter to the offender. This may help the client to learn ways to express him or herself in a non-damaging way, and hopefully work through the anger. Again the goal of this phase is to have the client make the ending of the story a positive one. Again this can take several sand trays. The third symptom is low self-esteem. I would suggest doing this with all clients who have been sexually abused. This is a session plan for after rapport has been built, I usually do it just before termination. This is a little different from the previous session plans in that you first start with the whale. The client starts off by building a sand tray on the things that are self-conscious about or things that make them feel bad about themselves. Then the next two tenets are combined. The client can then add onto that sand tray the positive aspects or things they like about themselves. I prefer to that they build a new sand tray of the positive to try to get them to totally focus on the positive. The client can build a bon bon box with several positive statements about themselves and build a sand tray about them that. If the client does not build the box that they can take home to remind them of all the good things about themselves when they start to feel bad themselves, they can take a picture of the positive sand tray and use it for the same purpose.